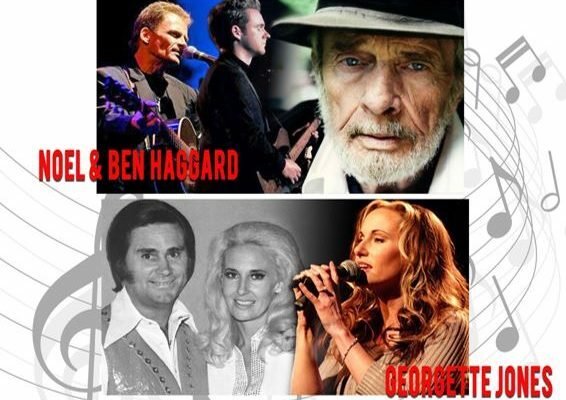 Ben & Noel Haggard-The Haggard Brothers, Sons of the Late Country Music Legend Merle Ben Haggard. Georgette Jones the daughter of Country Music Royalty, George Jones and Tammy Wynette. Ben is Merle’s youngest son. Ben began playing with the strangers at the age of 15 and toured with his father Merle Haggard playing lead guitar. Since the death of his father, now, at 23, Ben tours with his brother Noel and The Strangers finishing his father’s dates. Ben’s largest influences include Roy Nichols, Reggie Young, James Burton, Grady Martin and of course his father, Merle. Noel Haggard got a record deal with Atlantic Records and released his debut album, One Lifetime, in 1997. The album produced two singles, both of which peaked at No. 75 on the Billboard Hot Country Singles & Tracks chart. His first single, “Once You Learn,” also peaked at No. 72 on the RPM Country Tracks chart in Canada. His second single, “Tell Me Something Bad About Tulsa,” was covered by George Strait on his 2003 album Honkytonkville. Strait’s version of the song peaked at No. 11 on the Hot Country Singles & Tracks chart. Georgette Jones began singing with one or both parents since the age of three. Jones recorded her first single with her Dad, “Daddy Come Home” when she was ten years old and performed it on an HBO special. Georgette truly kicked off her musical career working as a backup singer for her Mom. Through the years, she has appeared on TV shows such as Crook and Chase, RFD-TV and The Grand Ole Opry. Georgette is a songwriter and member of SESAC and the CMA. A highlight of Jones’ career was recording a duet with Mark McGuinn that was included on his “One Man’s Crazy” CD. Georgette tours Ireland twice a year, where she has developed a very loyal fan base, as well Europe and Asia. A duet entitled “You and Me and Time”, which Georgette co-wrote for her Dad, was released as the first single from her Dad’s last CD, “Burn Your Playhouse Down”, released in 2008. Georgette filmed a TV series entitled “Sordid Lives” starring alongside Emmy award winner Leslie Jordan (Will and Grace) and many other big stars such as, Olivia Newton-John, Bonnie Bedelia (Die Hard), Margaret Cho and more.